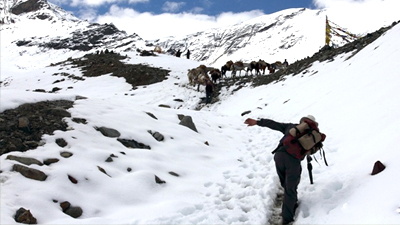 It is one of the popular treks in the Ladakh region that winds onto the Zanskar Valley and passes through several remote villages and ancient monasteries. The Darcha – Padum Trek along the Tsarap River and followed by Lakong river leads one onto the heart of the Zanskar valley after crossing Shingo La at an altitude of 5100meters. Darcha that is tucked at an altitude of 3360 meters is a small village in Lahaul region in Lahaul and Spiti district that falls on the Manali-Leh route. It secludes a cluster of dry-stone huts and dingy tent camps as well as it is also equipped with modern infrastructures like school, power and telephone connections. 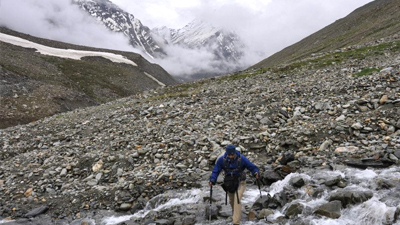 The gateway to the popular Darcha – Padum Trek, Darcha is an amazing stopover for trekkers. The trekking tracks from Darchu to Padum passes through several ups and downs and narrow tracks en route Palamo at 3600 meters followed by Chuminakpo-Lakong and Kargyak to Testa, Purne, which host one of the ancient monasteries, the Phuktal Gompa, to Ichar followed by Padum en route the tempting tracks to Mune. On the last stretch one can visit the Mune Monastery followed by Bardan Monastery. On arrival at Delhi airport, our representative will be there to meet you and take you to pre-booked hotel where our Delhi office manager will be there to welcome you. He will then discuss your next day schedule and handover your travel vouchers and necessary documents to you. In the morning, we will board the fastest train Shatabdi from Delhi station to Chandigarh, which will take only 3 hours and 10 minutes to cover the total distance. On arrival at Chandigarh, you will meet our trekking guide with the coach to transfer you to Manali in another 08-09 hours. En-route, stop for dinner. On arrival in Manali, check in at your hotel for an overnight stay. Today, we will take you for small acclimatization hiking tour that will include some important sightseeing places also. The group can take any necessary required things along with our guide. In the evening, we will visit a local house to experience the custom and life style of the locals. Later, we drive to the hotel for a night stay. The day will start with a drive to majestic Rohtang La through green valley’s offering an incredible experience. On the way, we will cross Keylong through small tribal villages and Chinab - the confluence of two famous rivers of the valley i.e. Chandra and Bhaga. Thereafter, we will be reaching ourt destination – Keylong, headquarter of Spiti and Lahoul and a Buddhist dominating area with couple of nice monasteries in surroundings. In the evening, you can go for a walk to Kardang Monastery, which is worth visit to experience the age old culture and to keep your muscles toned. An overnight stay at the hotel. Today, we will drive to Darcha through Jispa monastery and village. It is about 30 Km away from Keylong. From here, we will start our first day of trekking to Palamo (3825M). This trek will take around 5 hours to reach to our campsite where our camp staff will be there to welcome you with snacks and hot cup of tea/ coffee. Jispa and Darcha are two villages on the road side and leaving Darcha towards left side is the trail moving inside of Zanskar. Rareek and Chikka are two other villages that falls on our trekking way leaving you with some best views and sights. On the way, we pass a spectacular gorge and carry on along the left bank. An overnight stay at the Camp. The day starts with some of the stunning views of the beautiful surroundings that start glowing with the first rays of sun. After breakfast, we will go for gradual climbing of the mountain on the left bank until we reach our second camp site. An overnight stay at the Camp. Day 07: Zanskar Sumdo - Chumik Nakpo (4670 M) 6 hrs. Today, we will cross the second ford to go up the right hand valley following the stream that comes from Shingo La. Streams in Himalayas. Even if they look small, they must be crossed carefully. Here, we will be sharing the experience stories of our trekking guides who have been walking on these trails for several years. Enjoy a night stay at the Camp establish in a small meadow. Day 08: Chumik Nakpo - Climb to Shingo-La (5090 M) - Lakhang (4590M) 7/8 hrs. Today, we will cross the wonderful Shingo La pass. It will be a wonderful day for those who have never climbed to this height. Starting from the camp, we will climb moderate slopes to foot of the pass and slowly move upwards by leaving green valley behind us. We might encounter snow while going up and reach finally at the top of the pass of Shingo-la (5090 M.), which would surely be enchanting for the trekkers depending on the season and time. Here, you will witness the amazing view of various peaks from the pass and later walk over the glacier and fallen rocks while descending to the next side of the pass. Thereafter, we will reach Lakhang camp beside small stream in next 3 hours and enjoy a night stay at the Camp. Day 09: Lakhang - Kargyak (4230 M) 5/6 hrs. Pack up the Lakhang camp in the morning. After a wonderful breakfast, we will leave to cross a stream after some time and come to the right side of stream to continue with our day trekking. Thereafter, we will walk on a mass of fallen rocks and again cross a small stream. After an hour walk, we will pass beneath the face of the Gomborangjum and then an easy descent trek will take us to the first village of Zanskar region, Kargyak. In the evening, we will take a walk around Kargyak and later reach to our camp. An overnight stay at the Camp. Day 10: Kargyak - Purne (3965 M) 6 hrs. In the morning after breakfast, we will proceed for our next destination, Purne, which is another Buddhist area. While walking through this Buddhist regions, we should always go from the left side of Chorten (Stupa) and recite as “Om Mane Padme Hum”. This is not mandatory, but it looks advisable as a trekker regards the global religion. After the village, we will continue on the right bank with an easy walk and reach Tanze, which is a small village with a Gompa (monastery) in ruins a bit higher up. At a short distance after Tanze, there is a small bridge across to the left bank and a slight rise leads to Kuru, a major village of livestock breeders. Thereafter, we will reach Testa, which is a beautiful village. The path further continues downwards near the river and we will stay on the left bank to climb to Yal. From here, we will take steep descent towards a large bridge, which we will be crossing to reach Purne. An overnight stay at the Camp. Day 11: Kargyak – Trek to explore Phuktal Monastery (4055 M) and back to Purne 6 hrs. Today, we will trek to Phuktal Gompa, which is the 11th century monastery and is like a honey climb cut into rock under a graphic limestone cave. It belongs to the Gelupas (Yellow Cap) sect and the cave is a spring believed to have water of healing properties. We will be going up the right bank of the Tsarap River in to the splendid gorges and after crossing a bridge we will walk up for few more minutes where a ridge leads to a small plateau sprinkled with Chorten and religious banners. 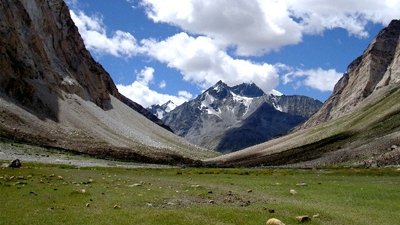 From here, we will witness the most spectacular sights in the Zanskar regions. After visiting Phuktal Gompa, we will return by the same route to Purne for an overnight stay at the Camp. Day 12: Purne - Phibula (3865M) 5/6 hrs. In the morning after breakfast, we will leave Purne to come back to the bridge and then go up the left bank through frequent small canyons of pudding stones. We will pass a bit above a hanging bridge that leads to the village of Cha and two hours later, we will reach Kheydang, a small village in a poplar grove. Finally, we will reach to Phibula. An overnight stay at the camp. Day 13: Phibula - Raru (3960M) 6 hrs. Today, we will trek to Raru. It is a long way to reach a large bridge that leads to Ichar village. From here, we will take a steady climb before coming to a major tributary and then to the campsite of Raru. Our camp here will be set near the lake, which is extremely wonderful. Enjoy a night stay at Camp. Day 14: Phibula - Padum (3,530 M) 5/6 hrs. In the morning, we will cross a beautiful plain covered with flowers and later watch the monastery of Mune. We will further go down to a steep incline and reach the main track. After two hours, we will arrive at Burdan Gompa, a Kargyudpa Monastery famous for its prayer wheel. We will be visiting several beautiful villages on the right bank of Tsarap River and then a dusty trail will take you to the sub headquarter of Zanskar regions, Padum. An overnight stay at the hotel. The day is free to visit Karsha and nearby places. An overnight stay at the hotel. The days are fixed for driving to Kargil and further to Leh. The day is fixed for sightseeing of Leh along with its famous old monasteries. We will board the morning flight from Leh to New Delhi. On arrival in Delhi, we will transfer you respectfully in the evening after dinner to the international airport to get the flight for onward destination.